Novakoski Quality Collision Ltd has been providing top quality collision repairs since 1975. Our collision services include major or minor repairs, painting & refinishing, glass installations, and an SGI inspection. We place strong importance on creating satisfactory customer service. To do this we want to ensure we lift the burden off your shoulders by taking your car to SGI for an estimate, delivering your car when it is done, and ensuring you have necessary transportation during your vehicle's service. We will also courteously clean your car inside & out after any repairs are made. To provide experienced workers, we make sure to hire certified journeyman technicians to get the job done. 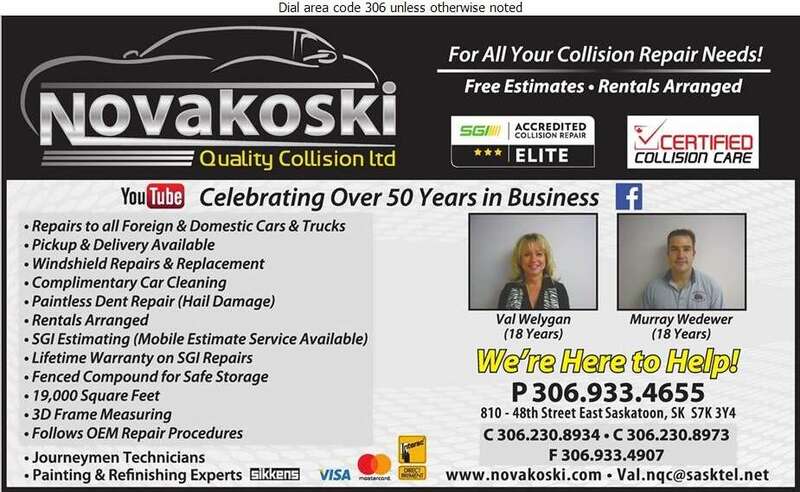 For all your collision repair needs come to Novakoski Quality Collision Ltd.